Rock Canyon Poets and Pioneer Book are please to present Utah poet Rob Carney! The event begins with an open mic at 6:30pm and runs until 8:00pm. Rob Carney is originally from Washington state and will be reading from his new poetry collection The Book of Sharks (Black Lawrence Press). He is the author of four previous books, including 88 Maps (Lost Horse Press), which was named a finalist for the Washington State Book Award, and Weather Report (Somondoco Press), which won the Utah Book Award for Poetry. His work has appeared in Cave Wall, Sugar House Review, Terrain: A Journal of the Built and Natural Environments, and dozens of other journals. He is a Professor of English and Literature at Utah Valley University and lives in Salt Lake City. Carney visits Pioneer Book as a guest of the Rock Canyon Poets and Pioneer Book. The reading and open mic are open to the general public. For more information, contact the Rock Canyon Poets, rockcanyonpoets@gmail.com. 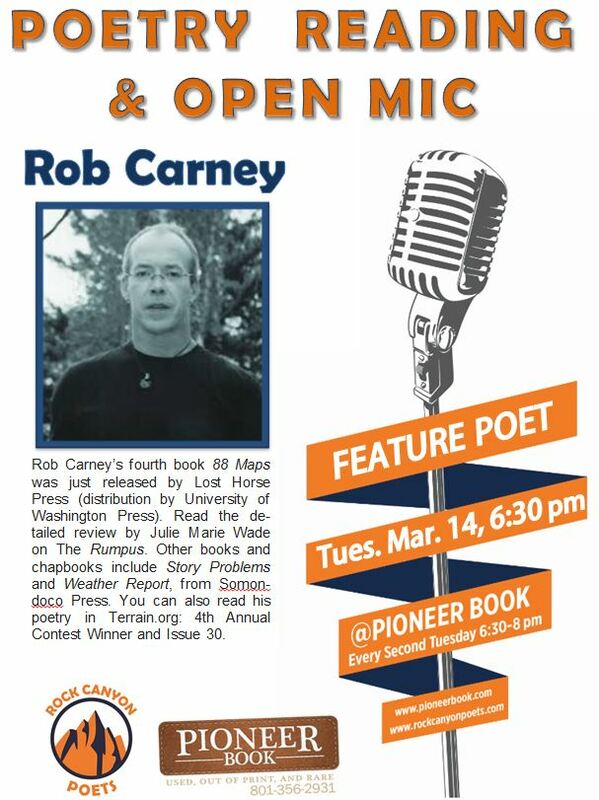 Rock Canyon Poets and Pioneer Book are please to present local favorite & UVU professor Rob Carney! Rob Carney is a poet and professor at Utah Valley University. His fourth book 88 Maps was just released by Lost Horse Press (distribution by University of Washington Press). Read the detailed review by Julie Marie Wade on The Rumpus here. Other books and chapbooks include Story Problems and Weather Report, from Somondoco Press. You can also read his poetry in Terrain.org: 4th Annual Contest Winner and Issue 30. And listen to a new radio interview with Rob Carney. Carney visits Pioneer Book as a guest of the Rock Canyon Poets. The reading and open mic are open to the general public. Click here to download a printable flyer.